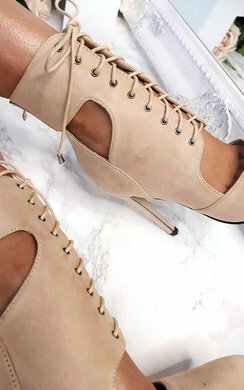 If you don’t own a pair of lace up heels in your shoe closet, you better hurry up and get a pair. They are always a hit no matter the occasion, and can turn any outfit into something much more appealing. Here at IKRUSH, we are obsessed with lace up heels and we thought we would share with you our top picks and some styling ideas to get you started! Firstly, one of our best sellers is our Loucia - these beaut lace up heels are faux suede and come in a variety of 5 different colours, featuring a super cute faux fur detailing along with the lace up tie. We would style this with a cute denim mini skirt and crop top for a fun and girly vibe for a date night with your boo. Next up we have our Sasha! These more subtle lace up heels are complemented with the diamante detailing around the ankle, a fun twist on the classic barely there style heel. Style these lace up heels with a killer bodycon mini dress and faux fur coat to be extra glam for a night on the town! Our Saskia are for sure the heels to choose if you are wanting to be the centre of attention! Thighs the limit in these beauts as the lace up detailing goes all the way up to your thigh for that sultry vibe. We would advise not to over accessories with these lace up heels - make them the star of the show and style with a basic bodycon mini dress! Lastly, we have our Alexandra that are just new in! Pointed toe stilettos with a lace up corset style detailing at the front, Kim K would be jealous! These are a must in every girl’s wardrobe as they ooze style and elegance! Pair with your fave pair of skinnies for a chic vibe!